ANOTHER MAJOR REMINDER WHOEVER YOU ARE WHEREVER YOU ARE WHATEVER YOU ARE NOT TO GIVE UP WHATSOEVER OKAY! Back to blogging just in time for Christmas 2016! IF YOU HAVE NO IDEA WHO I AM WELL FIRSTLY I DON’T BLAME YOU BUT TO BE VERY SHORT AND SWEET BY WAY OR REINTRODUCING MYSELF TO THE WORLD THROUGH THSIS BLOG I’M CURRENTLY A 21 YEAR OLD,CARER AND STUDENT, BUT ALSO MANY OTHER TITLES INLCUDING FRIEND AND I STILL LIVE AT HOME SO IF YOU’RE SAT THERE FEELING LIKE A FAILURE WITH NO HOPE THEN COUNT YOUT BLESSSINGS THAT YOU ARE NOT ME – A MESS OF A PERSON – CONVINVING MYSELF THAT I’M PERFECT. BELIEVE IT OR NOT I AM RATHER PARTIAL AND IF ONLY I COULD STOP OVERTHINKING I WOULD ENJOY IT SO MCUH MORE AND REAP THE THERAPUTIC EFFECTS AND BE ABLE TO FEARLESSLY SHARE MY THOUGHTS WITHOUT CONSTANTLY BEIGN PARALYSED BY MAD THOUGHTS CONTRADICTIONS QUESTIONS OPINIONS PERSPECTIVES- FOR ONE TINY SPECK OF A HUMAN BEING ON THIS VAST UNIVERSE THAT IS EXHAUSTING – ESPECIALLY WHEN THIIS MESSED UP MIND IS JUST ONE ELEMENT OF ALL THE OTHER ISSUES. HOWEVER BEIGN A FIGHTER I AM NOT GIVING UP, I AM STAYING ALIVE,I AM RYING ABOVE AND EBYOND TO STAY POSITIVE AND GRATEFUL AND I HOPE I CAN EFFECTIVELY SHARE MY CREATIVE AND OTEHR IDEAS AND VE OF HELP TO OTHER AND VICE VERSA.I HOPE THAT FROM TODAY I CAN FIT IN BLOGGING INTO MY TIEM LIMITING BUSY SCHEDULE AND POST A LOT MORE REGULARLY AND WITH CONSISTENTLY IMPROVED CONTENT ABOUT PRETTY MUCH ANYTHING – SPIRITUALITY, FOOD,DRINK,FASHION,BODYCARE,SKINCARE,HAIRCARE,MAKEUP,SCHOOL,COLLEGE,WORK,ORGANISATION,BULLYING,SPOTS,SCARS,HOME STUDY, BEING 21 YEARS OLD, THING SI’VE LARNT THIGN SI STILL NEED TO LEARN, MENTAL HEALTH, ISSUES,REMEDIES,NEGATIVITY,POSITIVITY ETC. AS ALWAYS I ASK THAT MY READERS BE KIND ENOUGH TO SUGGEST TYPES OF BLOG POST THEY’D LIKE TO SEE SO THAT I TRY ABOVE AND BEYOND TO KEEP ON TRACK BUT I AM SAYING STRAIGHTAWAY I DO STILL STRUGGLE WITH TIMING AND NEED TO TAKE TIME TO GET THINGS EVEN REMOTELY OF GOOD QUALITY. HOPEFULLY AS YEARS GO BY I WILL GET FRUITION OF MY EFFORTS AND PREVAIL. HOWEVER I AM VERY REAL AND DON’T SUGARCOAT THINGS ALL THE TIME SO PLEASE BE PREPARED FOR HONEST, GRITTY, NO NONSENSE REVIEWS AND OTHER TYPES OF POSTS. I ALSO AM QUITE SELF CENTERED. I THINK ONE OF MANY HOPES I AHEV THROGUH BLOGGIN IS TO FIX MYSELF AS WELL. I AM NOT EXPECTING OVERNIGHT RESULTS, DESPITE BEING DELUSIONAL, BUT I DO THINK I DESERVE A LOT MORE CLARITY OF MIND AND BETTER FOCUS, CONCENTRATION, PURPOSE AND I AM HOPINH READERS CAN HELP MEAND VICE VERSA. I MUST NOT BE ALOVE IN THE WORLD IF THE OLD FOLKLORE SAYING HAVE ANY TRUTH TO THEM. I BLABBER, I REPEAT MYSELF, I CRY, I SWEAR, I SHOUT, I MESS THIGNS UP, I FAI;=L, I PROCRASTINATE, I GET INTO INTO TROUBLE, AND THIS IS ALL DESPITE BEING THE MOST OCD AND CAREFUL PERSON IN WORLD, BUT AS ALL HUMAN I AM NOT INVINCIBLE AND SADLY I AHEV TO ACCEPT REALITY- BUT AT THE SAME TIME I AM ALSO REALLY INTO THSI WHOLE LAW OF ATTRACTION THING SO MAYBE IN TIME THINGS WILL MANIFEST IN MY FAVOUR BECAUSE DAMN UNIVERSE KNOWS HOW MUCH I TRY NIGHT AND DAY. BLOGGING IS BOTH A BURDEN AND A BLESSING AS I TRY TO PACK IN AS MUCH AS MY THOUGHTS AS POSSIBLE SO I HIPE WITH PRACTICE I’LL GET BETTER AND THAT OI GET HONEST HELPFUL HEARTY FEEDBACK FROM YOU ALL. THAT’S PRETTY MUCH IT FOR NOW AND IT’S DIFFICULT TO STOP MYSELF FROM BLABBERING(TRUST ME IF THE WORLD SOMEHOW HAD ACCESS TO ALL MY PERSONAL PRIVATE NON POSTED DOCUMENTS AND RECORDINGS AS WELL AS THE CONTENTS OF MY MIND – THEN YOU’D START TO UNDERSTAND – BUT TO GET EVERYONE UNDERSTANDING? THAT’S WISHFUL THINKING!). WHETHER OR NOT YOU CELEBRATE OR ARE RELIGIOUS OR NOT I SINCERELY HOPE YOU ALL HAVE AN ABSOLUTELY AMAZING CHRISTMAS TIME AND BEYOND JUST AS MUCH AS I WISH FOR MYSELF. IT’S END OF 2016 AND THERE IS STILL SO MUCH THAT CAN BE IMPROVED IN THE WORLD. I HOEP THROUGH MAKING FRIENDS ON HERE THAT WE CAN WORK TOGETHER TO CREATE POSTIVE CHANGE. THIS IS QUITE SIMPLY YET ANOTHER VERY BRIEF,STIFLED, TO THE POINT SPONTANEOUS POST I AM TYPING FROM MY GORGEOUSYET-STILL-NEEDS-TO-BE-FIXED-BY-LENOVO-AND-MICROSOFT- LAPTOP WHICH I AM SO GLAD I NOW HAVE A NEW CHARGER FOR MEANING I CAN UTILISE AS AND WHEN. I AM ONE TO UNASHAMEDLY OVERHSARE TINY TO EVERYTHIGN IN BETWEEN TO MAJOR DETAILS ABOUT MY OWN LIFE TO OVERYONE AND EVERYTHING ONLINE, BYT PHONE AND IN PERSON AND I AM USED TO THE VARIETY OF REPONSES SO YOU COULD SAY IM NOT FAZED ANYMORE BY MINDLESS IDIOTS WITH NO COMPASSION ALRIHGT! IT;S 01:41AM ON 6TH JAN 2017 & AS MUCH AS IM TERRIFIEF IM CHOOSING TO BE GRATEFUK. IN A FEW HOURS IVE GOT A QUITE IMPORTANT OUTPATIENT APPOINTMENT WHICH IS BASICALLY TO SEE IF ONE OF THE SYMPTOMS I SHOWED TO DR ANGELA IS INFACT CANCER. I WILL BE HONEST I WAS NOT EXPECTING HER TO REFER ME FROM A SIMPLE LITTLE NEW THING I FOUDN AND WHEN I SAW LETTER I WAS SHOCKED BUT WHATEVER THE OUTCOME I TRUST GOD/ANGELS/UNIVERSE/JESUS/ALLAH/BHAGWAN/UNIVERSE/WORLD/SYNCHRONICITY ETC. WITHOUT GOING INTO MY USUAL HABIT AT ALL IM LITERALLY KIDNLY USGGESTIN T YOU GUYS WHOEVER READS THIS IF YOU’RE FEELING LOSTS/DEPRESSED/ANXIOUS/WITH NO DIRECTION/LIEK A FAILURE ETC AND ANY OHTER NEGATIVE THUGHTS/HAPPENINGS.YOU DONT AHVE TO JSUT COPE. THERE IS AND WILL BE MORE HELP OUT THERE AND ALL YOU HAVE TO DO IS ASK AND ITS A LOT SIMPLER THAN YOU MAY THINK. I CANNOT GURANTEE INSTANT REPLIES OR MIRACLES OR ACCOMPLISHMENTS TO YOUR ACTS OF REQUESTING HELP BUT I DO THINK I AVE SOME KIND OF DIVINE DUTY TO SIMPLY SAY LOOK AT STATE OF ME AND IM NOT GIVINGUO NEITHER SHOULD YOU BEAUTIFUL PEOPLE. ALRIGHT I AM TIRED AND SHOUDL REST FOR AT LEAST AN HOUR . Are we all aware of how much we are being spied upon? I am paranoid to say least and being a real human I have made many mistakes unintentionally.One major part of my life is internet/technology/.Of course I am truly grateful so don’t get me wrong. But you cannot be critical of my questions as to the security of all our .Who know how many of us there.And there is all the computer automated things too.What’s real and false. Will I ever get fruitiom of all this time I spend online.Will the overload of info ever be of use? I know it’s not all for me its for the world but as with everything no one tathewhmewhen the.Of course lots of people family friends neighbours strangers have given me advice but itsoverwhelming and contradictory just like the internet .But there’s no one size fits all rulebook that everyone was given.And being religious make it even more weird. Since age 10 I have carried out all types of unpaid internet research unlike any other and yes I very much deserve to boast especially as I have gained nothing. Overthinking I am now a 21 yr old and I typing through literal headache.Hopefully the painkiller will help soon. Also listening to Radio 1 trying to calm down and relax etc.But undoubtedly many others have benefitted even this right now If any of you know how to legitimately make cash from all these years of daily research online ?-all the watching, listening,reading,typing,sharing,posting,time,money,internet,electricity,light,efforts,sacrifices,actions etc?! In recent years life has got worse and some of many bad things that have occurred is gettint into trouble with police and college staff for apparent. If only they knew the extent of my agony. Desperation to fix problems causes a person to try many things including begging for help to strangers on internet.I literally have jumped on all the social media platform wagons but where has it got me as of yet? So reading a book called Social Research Methods by Alan Bryman as well as recent events in personal life has initiated my need to post this blog. The more these incidents have happened my already messef up mind has gone into further paralysis and overdrive messily at same time and among estioms. I mean I am obviously not that interesting, I am not a celebrity, I am not a high flying well known top profile member of societu but I still feel spied upon and if even if my personal emails are not private then what does that say for all the internet.Is anything private at all. And I mean not just government or organisations by time but who exactly are these freakish people who have so much background knowledge of internet and technology and all the terminology? I don’t know what my aim is with this kind of non purchase related post but i am interested to know what are your thoughts? Are you as constantly inquisitive as I? Is the internet and technology in favour or not? Am I alone in feeling so isolated and overhwhelmed and cursed with fear of something I have to use everyday?I mean let’s be real its 2016 you cannot avoid technology and being someone who wants to be up to date and smartest at everything yet its mental torture. Argh I cannot explain perfect words even though I journal and type and talk and explain and record and document and write so much but this feels very conplex.Am I under the illusion that all know more than me and is this normal? The more I research I feel even more dumbo? What is wrong with me? Am I ever going to have peace of mind? I want to be productive but I havent actually achieved anything in all these years in any aspect yes I may havr grown in height a bit. I have also so many how to articles its ridiculous.I wish it would all come to fruition and that I could create something meaningful for world. Can people please help me.Not useless recomendations and not sarcastic or offensive comments.But like real help.O want perfect ideal productive opportunities that help me and others in best way. I know its possible after all when I see and hear others success. Creative and business and music and film and educational and travel opportunities etc.I am imaginative and creative and hardworking and I would truly appreciate making ideal successful wonderful friends and maybe my overthinking will be of use to world. I am not even touching upon and I hope with this positive tone I will through law of attraction or whatever bring into my life well deserved events opportunities invites miracles rewards etc. I still consider myself blessed in every aspect so am trying above and beyond to be righteous & make the most of every second of my precious life. Snack items haul from b&m bargains in Lancashire. It’s 03:47am of friday sat here very cold weather but must not complain as i qm blessed but you readers has . On with the mini haul from b&m bargains.Not sure where else their company also operates. Hope you enjoyed this brave new post. Please offer suggestions advice comments and helpful advice. I could sure use new friends but they have to add success to my life online and offline. NO SLEEP FOR A LONG TERM FAILED PROCRASTINATOR – JOURNEY OF LEARNING – AIMING TO BE A WELL BALANCED PRODUCTIVE HAPPY INDIVIDUAL. May the world enjot this no makeup ugly fake smile stupid selfie i took whilst sat up wasting time electricity money internet energy time etc instead of work. Hi guys I hope you’re all well! Basically in case you don’t already know which is most likely as I hardly have any like comments subscribers yet but recently Zo created yet another you tube channel yet this time I actually do upload videos rather than just using to like comment subscribe to other people’s videos. I’ve been using the Internet extremely daily thoroughly madly secretly unproductively gratefully for more than 10 years at least and that includes regular daily probably too much secret hiding watching listening of millions of YouTube videos. It’s way about or past time that I started uploading my own content but don’t expect the usual perfected type of videos that most Youtubers present. Although I’ve researched into how to edit and create and upload etc the truth is I’m still clueless which is one of main reasons I don’t edit my videos whatsoever but this doesn’t mean they don’t take time effirt patience and a great intention. I talk or perhaps sometimes even sing about anything and everything to an extent therefore no particular theme just like my blog and my Twitter and my other secret social media accounts and my life in general! I could go on and on and on and quite honestly have had to force myself to cut out many paragraphs from the original version of this post because I think busy readers appreciate more simplicity. The topics I discuss can be anything from beauty to spirituality to books to reviews to depression to anxiety to employment to Hinduism to spirituality etc. You might mistake my not having a certain schedule as to days and times of my blogs and blogs but actually it’s because I think the spontaneity is what will keep my unique platforms interesting. I’m trying my best each day to be more productive and better at time management and quicker including the typing of this short post and also because it’s all secretive from my family and friends who to my knowledge are not aware of my anonymous blogs blogs accounts etc. I don’t get paid money whatsoever for any of my content just a disclaimer there in case you’re wondering why I’m very consistent on uploading but despite my untypical life including the thoughts memories feelings experiences theories etc I’m probably just a tiny irrelevant speck in this universe and using technology to share unique content from my own perspective is genuinely it’s a way for me to put something good into the world I think. Really hoping you all kindly check out my what I I try to emit as meaningful creations and do beckon enough to suggest tag and q&a ideas and also show me support by liking commenting subscribing etc. First of all I’m aware of spelling and grammar errors but unapologetic. 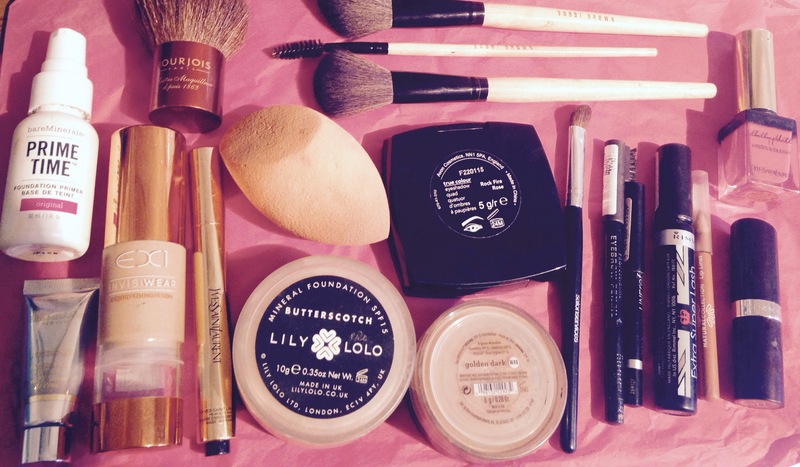 I have used a lot of makeup in the last 7 years alone everything and anything from the lesser known products to popular brands from drug store to high street to designer. Not a professional makeup artist with certificates and probably do everything wrong according to their standards but O love being creative and I suppose especially when using lots of various colours and shades and techniques, applying makeup to face is a form of art! This combination pictures above is actually very minimised in comparison to usual concoction of unnecessary products I tend to use and believe it or not I still look extremely ugly which has led me to yet again try a no makeup challenge commencing from today. To be honest I look unfortunately very ugly either way but in the grand scheme of things there’s mor important things to focus on and worry about and being a constant wreck of the worst anxiety this is easy. Anyway so a brief review of these particular products which some of you may have already used it be interested in purchasing in future. After thoroughly cleansing toning and moisturising my sensitive little brown face I go ahead and apply a serum but recently have been using a sample size of the Elizabeth Arden superstart which claims to be a great base to use before moisturiser and serum. Then I use my bare mineral original primer. Then I use my real techniques egg shaped miracle complexion sponge to apply my ex1 inviswear foundation in the 3rd shade which is quite a good match. The I use shade 5 of the touch eclat concealer/highlighter pen on any areas I feel it’s suitable. Rather than a setting powder I use Lilly Lolo’s mineral foundation in the shade Butterscoth which is a medium yellows tone. Then I use bare minerals mineral powder foundation as a bronzer/contour colour and end up looking seven shades darker than my natural skin colour. I’m not going to go into detail of the eye and lip colours because originally I was just going to do a bar makeup post but I though I’d add in a few more goodies for my readers. But you can see from the picture roughly the products I use.if you want to know what I think of individual products such as the bare minerals foundation and the YSL combo then I’ve done previous posts in detail on such products which may help you! I feel compelled to post among all my other weird actions since I’ve been sat here literally since six o clock, not moved much if at all,have no appetite for food or drink or even life to be honest, not going outside, too scared of people and things, don’t have a job ,don’t have a formal education,not making any income hopefully someone will soon pick up on my posts and I don’t know offer me some kind of salary but for the last 8 years I’ve been daily using Internet no one has ever paid me therefore I have to just continue fighting. You’re probably thinking what does all this have to do with makeup but trust me there’s a reason I called my most recent social media accounts including this one General Grace ! Hope you enjoyed and that I will somehow attract the right help support opportunities friends invites clarity peace etc into my life. Travel Stories, Vegan-ness and Opinions. Fashion, Beauty and Travel Blog. Frost your skin right, a BORNEO Lifestyle and beauty blog! Beauty, Fashion, Lifestyle, Travel, and much more! Advice and Review, that's what I do! Your daily dose of pretty, one well-heeled step at a time. A review a week, keeps the £s in check. glimpses of life captured through the lens of the heart..